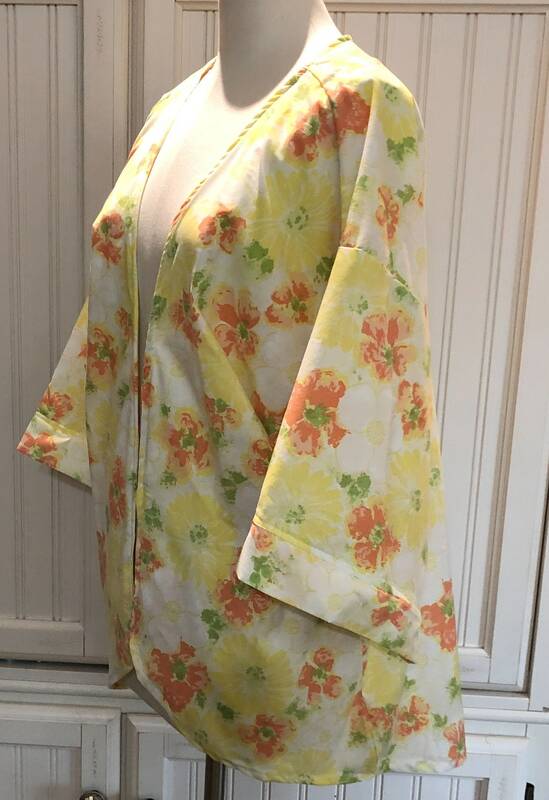 This beautiful kimono style jacket is made from repurposed vintage linens. 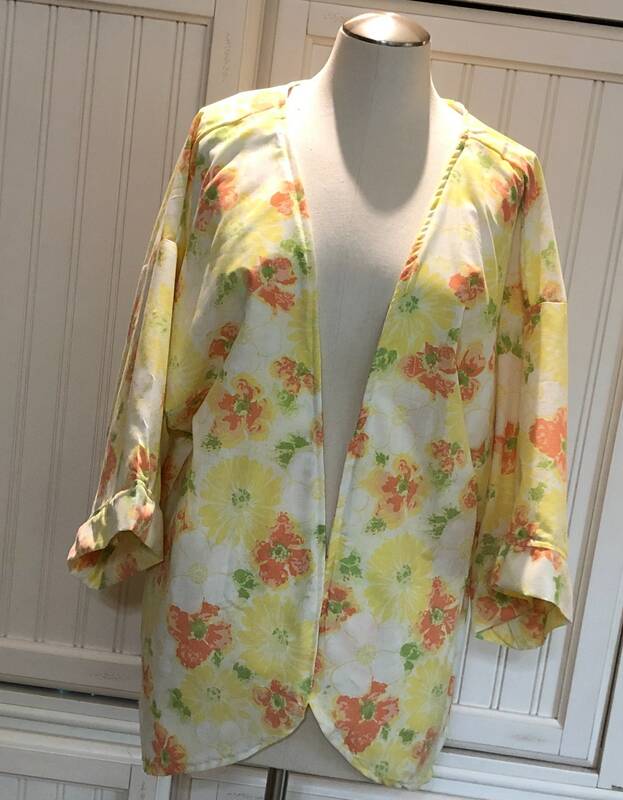 A very special yellow and orange flower print sheet with white background makes the front of the kimono easy close and the light cotton gives the jacket a gentle floating high low hemline. 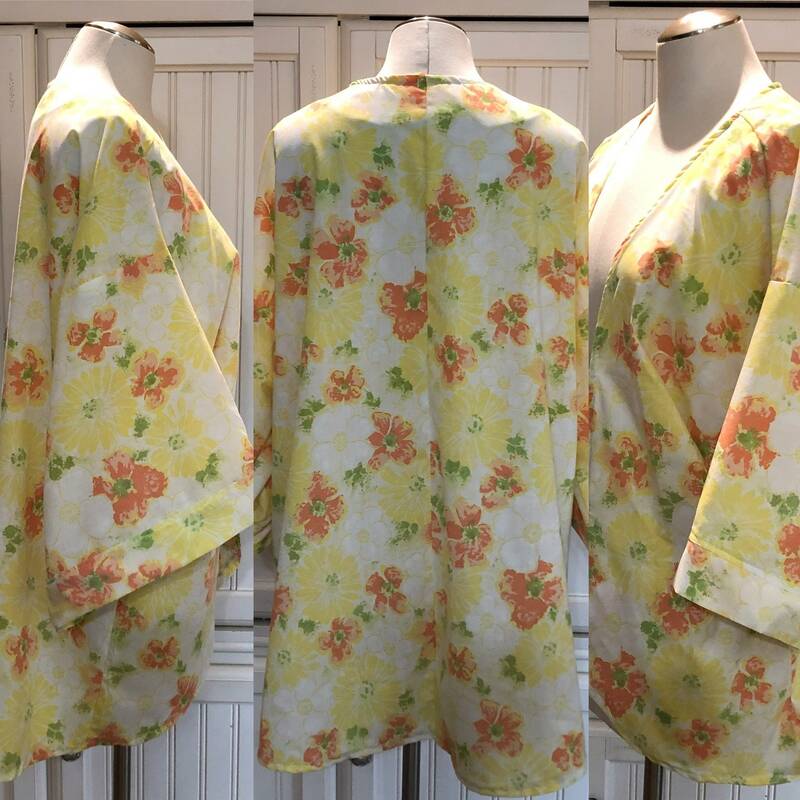 The sleeves are wide kimono style and slightly longer than 3/4 length with cuff that matches. This structure allows for a flowing line. 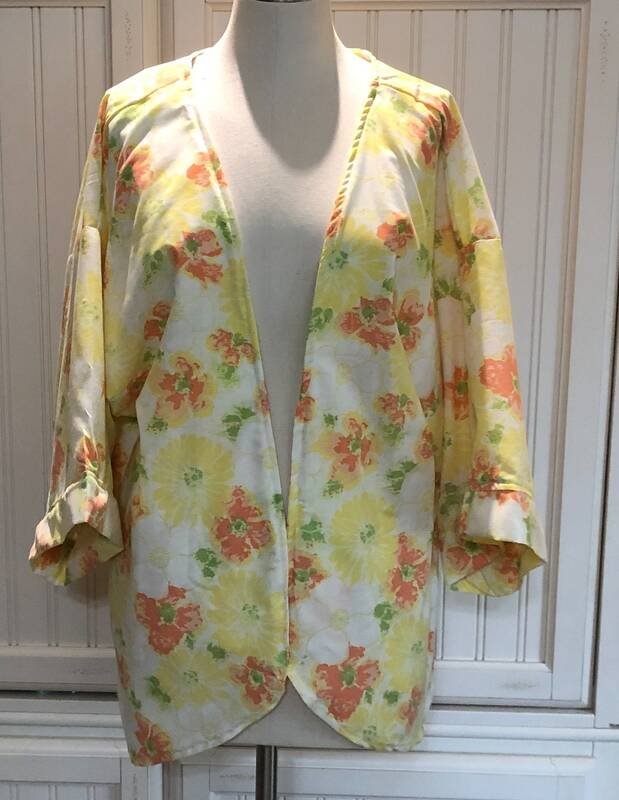 This is a very special one of a kind piece of clothing that I am sure you will love. The style can easily fit from S-1x comfortably. Shoulder to back hem 36"
Front shoulder to hem 34"
All vintage linens are carefully washed and stains gently removed. No fully intact unblemished vintage linens were harmed in making this piece. 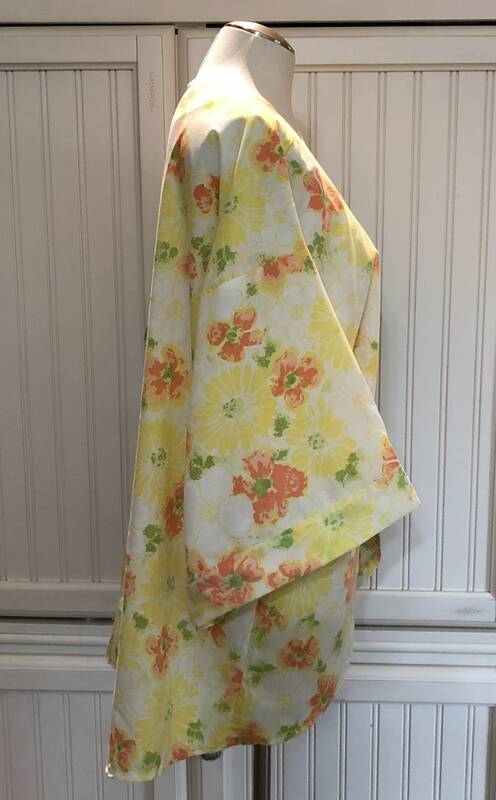 Vintage style patterns are often used in repurposing the linens. Some of my thoughts behind my new line, Vintage Linen Rebirth into vintage wear. Often I need to fussy cut the embroidery to avoid stains and holes in the original linens. The majority of the materials used are repurposed from the vintage linen. This style or repurposing existing materials is typical of 1940's wartime scrap aprons. In the 1940s wartime UK everything was rationed and therefore in short supply. Everyone had to be thrifty and inventive of how to preserve things they had, and also recycle everything to make new things. Make do and mend were the buzz words of the era, and upcycling and recycling were things everyone did to try and make ends meet. Aprons were very popular at this time not only could they be made from recycled scraps of material but they also performed a function in that they kept your clothes clean, which meant that your clothes lasted longer. With that spirit in mind, I am hunting for beautifully embellished linens to give a new life as a vintage style wear. 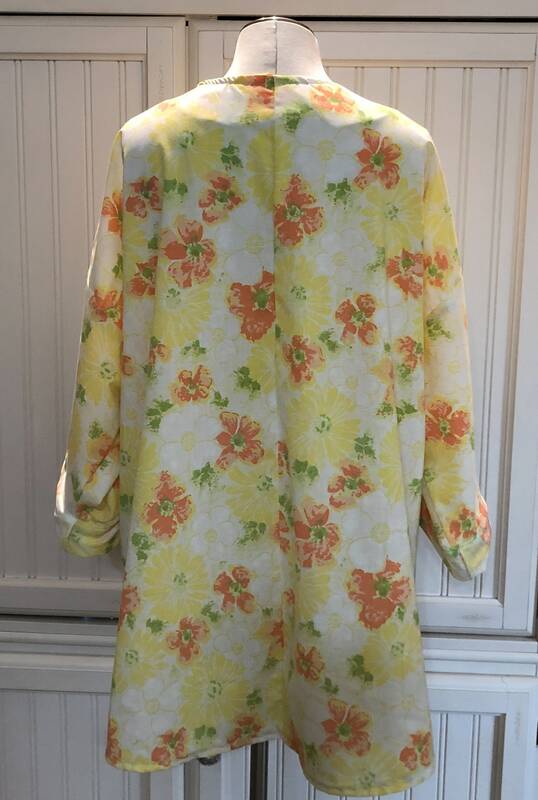 In this quest I will pledge to not harm any vintage linen that is unblemished. I will honor the vintage linen and when it has given its full life in its current form, I will pass on its heritage in a form to be again cherished and loved.